Well designed Aptitude Tests have been shown to be one of the absolute best predictors of workplace performance. PsyAsia International’s Aptitude Tests are chosen carefully to ensure that the assessments reflect contemporary work needs. Many of our non-psychologist competitors simply distribute whatever aptitude tests they can get their hands on and are often unaware of how to evaluate the different aptitude tests on the market. At PsyAsia International, our doctoral-level and award-winning psychologists have thoroughly reviewed the tests we sell to ensure superior reliability and validity. To this end we work with the world’s most renowned test publishers. The use of Aptitude Tests is widely acknowledged to be one of the most successful methods of predicting an individual’s success within a role, for both job applicants and succession planning. In fact, did you know they are more predictive than most personality assessments and interviews? These benefits only hold true for aptitude tests designed by psychologists and psychometricians who understand statistics and reliability and validity issues in psychometrics. Increase the likelihood of selecting the best person for the job. Provide an objective and standardized approach to assessment. Reduce bias in the selection process. Send a message of professionalism to job applicants. Costs are reduced, as they can help filter out poorer candidates at an earlier stage of the selection process. Can be used to identify strengths and development needs for current employees. The Managerial and Professional Aptitude Tests comprise Numerical and Verbal Reasoning Tests. The Supervisory and Team Leader Aptitude Tests also comprise Numerical and Verbal Reasoning Tests. The Operative Aptitude Test series comprise 3 tests which assess Following Instructions, Using Numbers and Mechanical Understanding. The Clerical and Administrative Aptitude Test series comprise tests of Word Usage, Computation, Proof Checking and Cross-checking for Administrative & Clerical Staff. Our range of Psychometric Aptitude Tests have been designed by Chartered Psychologists who also develop tests for the world’s largest test publisher. 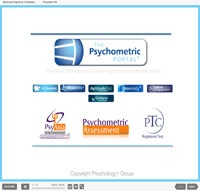 These tests are available in our Online Psychometric Testing System – The Psychometric Portal®. The system is available for those trained to use aptitude tests. Alternatively, for those not trained and accredited, our psychologists can assist untrained users with our Psychologist-on-Call™ Service. Worried about Online Aptitude Test Cheating? Don’t be! We have a tool called Validate which helps clients to identify and take action where cheating in the psychometric test is indicated.